Cats purr when they are content and happy, but also when they are scared or in pain. The frequency of this sound has been linked to stimulated healing and bone growth, and it is widely believed that endorphins are released when cats purr. Therefore, in addition to the obvious communication that occurs when a cat purrs, it can also improve their overall well being. Why Does My Cat Knead Things? This one is pretty simple. Kittens knead things as a way of showing contentment, and because the movement helps their mothers milk flow as the nurse. 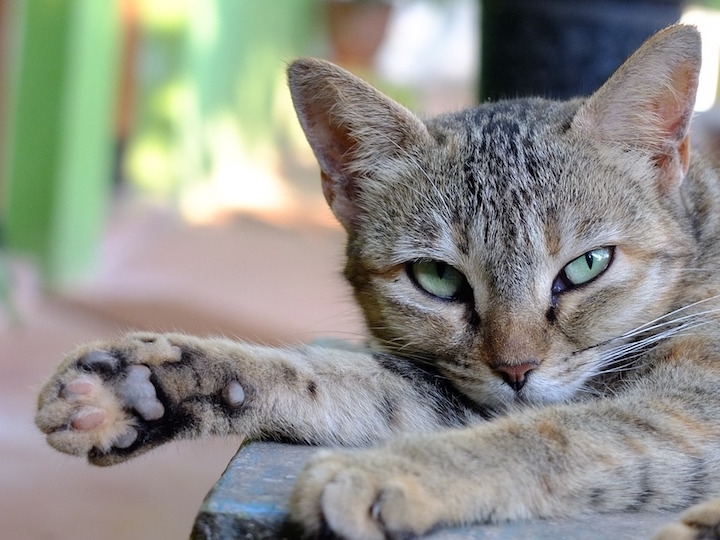 As cats start to mature, the kneading remains a sign of contentment, but is also used to mark their territory as cat’s perspire through the pads on their paws. Love bites, also known as petting-induced aggression, can be a confusing behaviour. However, it is simply their way of asserting themselves, and their position in the household. There may also be some neurological stimulus associated with being pet in certain areas or for longer periods of time. There is no need to fear interacting with your cat, simply try learning to recognize the warning signs before your cat starts biting. Why Does My Cat Eat My House Plants? Sometimes this behaviour will come from simple curiosity or boredom. Other times, cats notice leaves that flutter and assume it’s a toy. Grass and some other plants will act as a laxative or purgative for your cat, which will help with the passage of hairballs, which could be another reason they're so interested in consuming plants. The last possible explanation is that of a learned behaviour, where your cat has realized that playing with plants will get your attention.